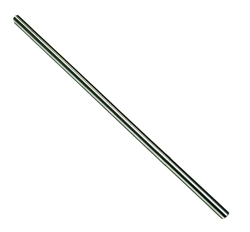 Length extending out from barrel: 9"
This guide rod can be used to check bore alignment on .40 cal firearms. It is turned from heat treated material on a swiss-style CNC lathe in one long cut to maintain optimum straightness. It sets down into the barrel ID and stops on the crown, allowing you to inspect alignment to suppressors or long muzzle devices. *** We did not black oxide these rods because the natural steel color contrasts better with most muzzle devices. Therefore the rods should be kept oiled to prevent rust while in storage.